Review: Horror and suspense novels are my guilty pleasures, like Reeses Peanut Butter Cups and a spoonful or three of Nutella. Not that I don’t love my literary fiction and fantasy books, but there’s always been something exciting and shocking when I get to read horror. 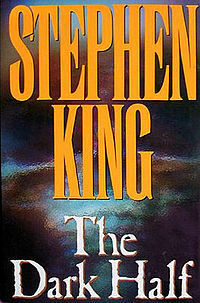 I expected the Dark Half to be similar to that, with Stephen King’s own weird twists and turns, where you suddenly stop reading and pause to think: Oh dear , I get it now (But I didn’t want to get it). The Dark Half didn’t really do it. The adrenaline didn’t catch, and ultimately – I guessed the ending within the first 2 chapters. This, in of itself, isn’t that strange given the amount of weird and horror literature that I read, but I’m always a bit disappointed when the ending is guessed so readily. That doesn’t mean, however, that it wasn’t a good read. It was written in 1989 (Can you believe that was 25 years ago?) so I already was hesitant. But the plot of Thad Beaumont and his confusing situation of his pen name, George Stark is intriguing to say the least. Quickly the reader learns that Thad was one of those strange twins in the womb that ate his twin… it’s not unnatural, still strange. Flash to current day where a “George Stark” is going around killing everyone related to making Thad give up his pen name for writing under his own moniker. Thad is a good character. He’s the clumsy writer who has a loving wife and two cute twins, Wendy and William. George is the evil side, a tobacco smoking alcoholic. There’s not much variance between the two at first sight. Once you get into the story though, and the characters some time to develop – I personally really appreciated a scene in which King really gives an insight into the two different characters, but not in the way you’d expect. Despite my disappointment at the books ending, I would seriously recommend this to anyone who maybe isn’t so big of a horror fan. It isn’t something that will stick with you and haunt for a few days because not many of us have a pen name which comes to life. But it’s a fun read, and something to stick your toes in if you aren’t the biggest horror reader. I read this in high school I think. I love the idea of an author’s pen name persona coming to life, and I think it’s interesting how Stephen King writes horror stories in which terrible things happen to writers as a result of their craft. But otherwise, I don’t remember much about the book, even the bit about Thad consuming his twin in the womb. Carrie and Apt Pupil made much more of an impression on me, and they’re still my favourites. I actually really enjoyed it but then again- I’m a super Stephen King fan 🙂 Really!? That’s like the best part. I’ve never read those! Have you read Salem’s Lot? That’s one of my favorites I think! Oh, well you might not like Carrie and Apt Pupil then, because our King preferences seem to be a bit different – I hated Salem’s Lot! I thought it was so boring. But if you do try Carrie and Apt Pupil, at least they’re both very short. Carrie was his first book, and Apt Pupil is the main story in his novella collection entitled Different Seasons (also includes The Shawshank Redemption and The Body, which was filmed as Stand By Me).